Jonathan Hickman and Image Comics have had a very nice, steady partnership for the last several years with Hickman penning such titles as East of West and The Manhattan Projects. His newest project at Image, The Dying & the Dead pairs him with another longtime collaborator, Ryan Bodenheim, who partnered with him on Secret and, back in 2008, A Red Mass for Mars. 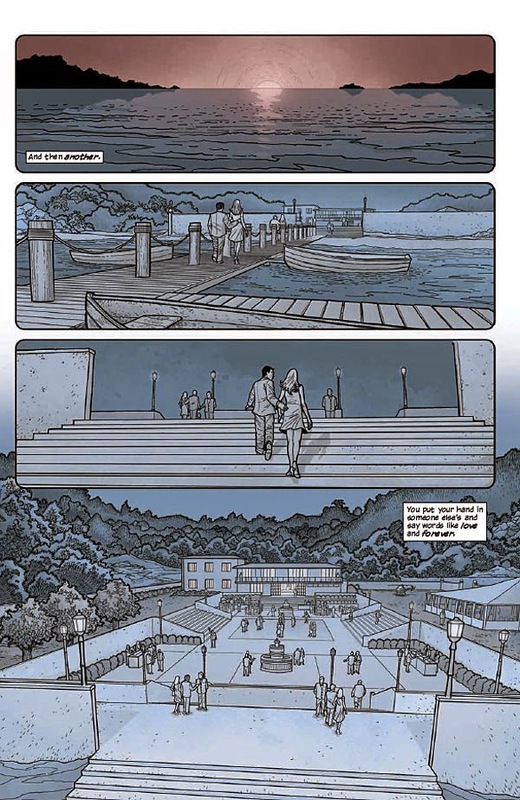 While Hickman has garnered much acclaim for his heavily designed and dense writing, he's received just as much criticism for his coldness and plot-centric storytelling that tends to avoid real character building. Does The Dying & The Dead fall into some of these traps? The series opens with a big, violent spy piece in 1969 involving a wedding, a massacre, a burglary, betrayal, and, believe it or not, clones. It's surprisingly intense despite not knowing the characters yet, and sets the tone for the series with its creepy and bloody underbelly just beneath the celebratory atmosphere, and it's got a real international thriller feel to it. For now, the rest of the book is largely unrelated, except that whatever was stolen has some deep and fantastical significance. This is a big book–64 pages in fact–and roughly 2/3 focuses on our main character and how he becomes involved. Colonel Edward James Canning is our protagonist, a decorated veteran of the U.S. army whose wife is in a coma with no signs of waking. He is offered a chance by a ghostly being to save her, which leads him to an underground city full of ancient beings who claim to have influenced all of human history. What's particularly unique here is that the Colonel has been here before; in fact, he seems to know more about the history of this secret place than his guide and eventual partner Shurra. There's a deep and compelling mystery about how this elderly man and this glorious fantasy race are connected, which is one of the things that has me interested enough to continue to the next issue. 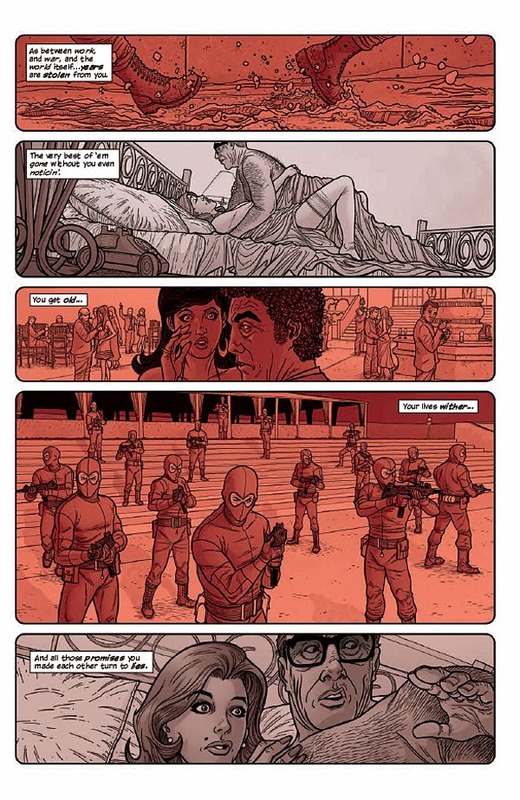 The other thing is that it seems that Hickman has hit a nice balance here, for a change. Although it is very philosophical and a bit dense, this is all couched in casual conversation, not hidden in puzzling language. It helps that the ideas being presented are pretty fascinating, in particular the way that it examines what it means to be a hero. Bravery, the ancient Bishop of the underground race claims, "is folly. [...] The regression of the evolved back to animal. From intellect to instinct." And yet, with all their unfathomable intellect, a brave man is exactly what they need in this circumstance. Bodenheim does an admirable job with the gargantuan script, running the gambit from violent heist to magical kingdom to talking heads, managing to make them all pretty engaging. The Colonel does not speak much, so we learn much of his character through his body language and facial expressions, which with a lesser artist might fall apart. Additionally, his designs of the ancient race are well done, giving them a lot of character and depth despite their complete lack of color. It's a great first issue, another potentially big hit for Image. 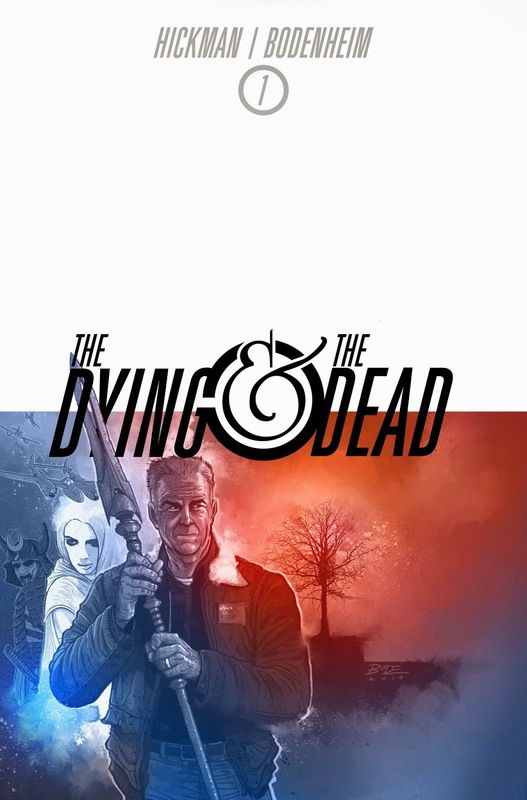 The Dying & The Dead #1 manages to capture a lot of what is great about Hickman's philosophical plotting while giving us enough character and a thoroughly intriguing if not still a bit vague concept to avoid his usual pitfalls. Your mileage may vary on Hickman, but at $3.50 for 64 pages that are full of interesting ideas and great art, it's definitely worth at least checking out the first issue.